Speed up your day-to-day energy management process through configurable widgets to monitor measurements, metrics and savings, and with a feed of all the energy wastage and failure notifications detected by our analytics software engines. Assess the expected savings when negotiating new energy contracts with Utilities. Enter the tariffs offered by the various Utilities and our tool will calculate how much you would have paid for the past 12 months with each tariff for an immediate benchmark. Evaluate quickly patterns of power consumption and when peak load demand happens. Overnight activity and periods of high power activity will guide you to sources of operational wastage. 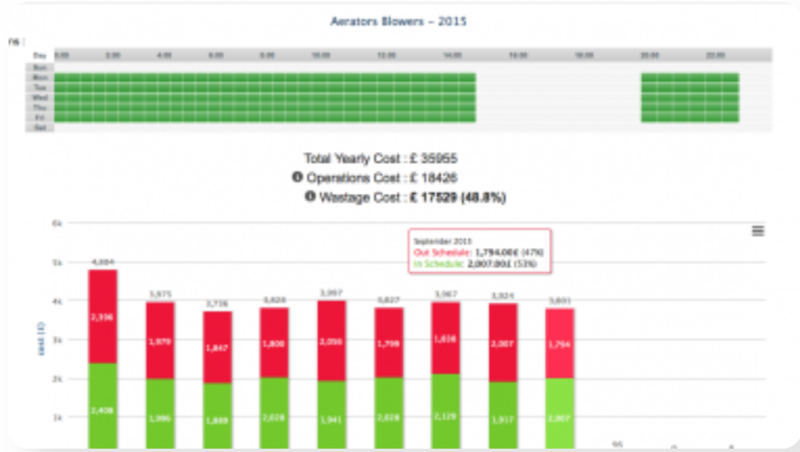 Analyse the energy used outside of business hours and get an estimate of the payback period if controllers & timers are deployed. Don’t waste any more time analysing raw measurements. Let our analytics engines compare your energy use against expected patterns and alert you when your consumption becomes abnormal. 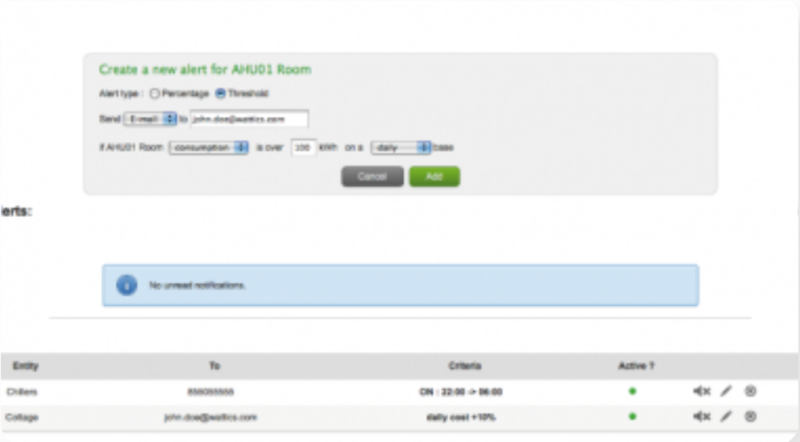 Create alerts and be notified as soon as cost or consumption deviates from the expected pattern. You can choose between alerts based on percentage increases/decreases, alerts based on thresholds comparison, and alerts based on power activity between time windows. Access and visualise the wide range of electrical parameters for deep power quality analysis. Navigating through different periods of time allows you to visualise the latest kW, PF, V, I and THD readings and analyse daily/weekly patterns. Data can be exported in one click to image, PDF and CSV format. Set baseline/reporting periods and routine/non-routine adjustments and let Wattics model your energy use and calculate kWh and €/$ savings according to IPMVP. Analyse and compare your consumption and associated costs to identify where your money is spent within your organisation and where energy saving efforts must focus on. You can discover increase/decrease trends over periods and calculate your savings. You can also enter adjustment values. Power usage effectiveness (PUE) is a measure of how efficiently a data center uses energy. Wattics dashboard provides you the tools to monitor in real-time your data centre PUE and be alerted whenever inefficiency is detected.